It takes a lot to make a team work, but the best managers have learned the power of an organised and stable team-oriented workplace. 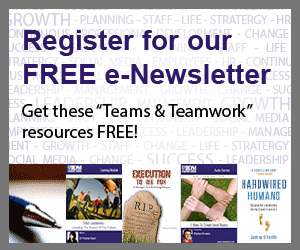 Below is a collection of articles to help you improve the teamwork in your workplace and build stronger outcomes for your business. Outstanding managers spend more time developing the strengths of individual team members than they do in correcting weaknesses. They encourage team members to continue to learn and grow rather than just settle for mediocrity. So how can you build on the strengths in your team? Research has identified what it takes to build strong and productive teams. The 12 factors identified are all associated with good morale, greater engagement, higher productivity, good working relationships both within and between teams, and greater customer satisfaction. Whether you are a manager or a team member, consider which of the following you can act on to help build a stronger and more productive team. Fact: You need a great team in order to succeed. Fiction: You need to have that great team in place from the start. Building teams takes time. Members of a fully functional team can be neither dependent nor independent; they must be interdependent within the context of a teamwork relationship. For organisations that are struggling with meeting goals, cost problems - or simply unsure why things aren't working as they ought to - regular problem solving meetings is a process worth adopting. Clear symptoms of a lack of a systemised approach to problem solving include fire fighting, customer complaints, blaming and finger pointing, and high employee turnover. This Learning Module provides a step-by-step guide to implementing Team Problem Solving processes into your organisation.